Please call owner Scott at 305-733-9714 or Email: showard1998@me.com - . Boat Location: Fort Lauderdale, Florida. 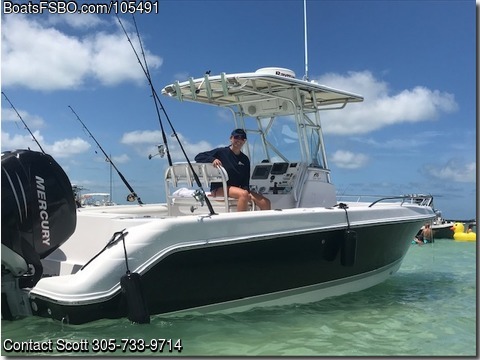 Raymarine C80 with Radar/GPS/Depthfinder, AM/FM Bluetooth Stereo, VHF Radio, Three Batteries with 2 New in 2018, Verado Power Electric Steering, Stainless Steel Props, Power Tilt & Trim, Live Baitwell, Fish Boxes, Rod Holders, Rocket Launchers, Hard T-Top, Full Gauges, Lots Of Storage, Porta Potti, Trim tabs, 3 Bilge Pumps, Coast Guard Safety Package, Anchor, and Cockpit Cover. Cushions are in decent shape, Bow Cushion was added about a year ago, Engines have about 950 hours each Starboard Engine has New Power Head in December 2018. Includes Matching Tri-Axle Trailer with New Tires in 2017. This boat has always been Professionally Maintained, and Dry Stored.